(2009/JAT) NTSC, Code 0, Color and B&W, ca.60 Mins. 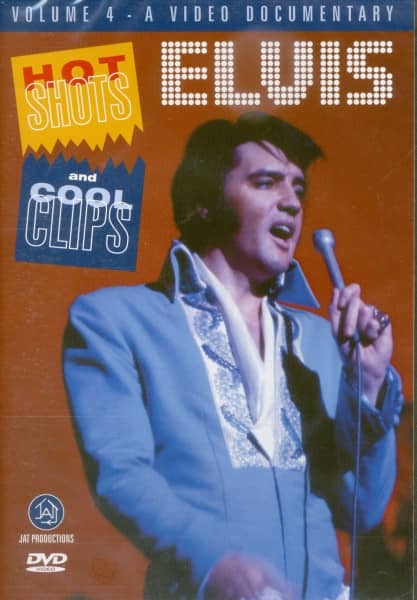 Elvis: Hot Shots And Cool Clips Volume 4 continues the acclaimed JAT series, containing more extraordinary footage of the most fascinating performer in history — Elvis Presley. 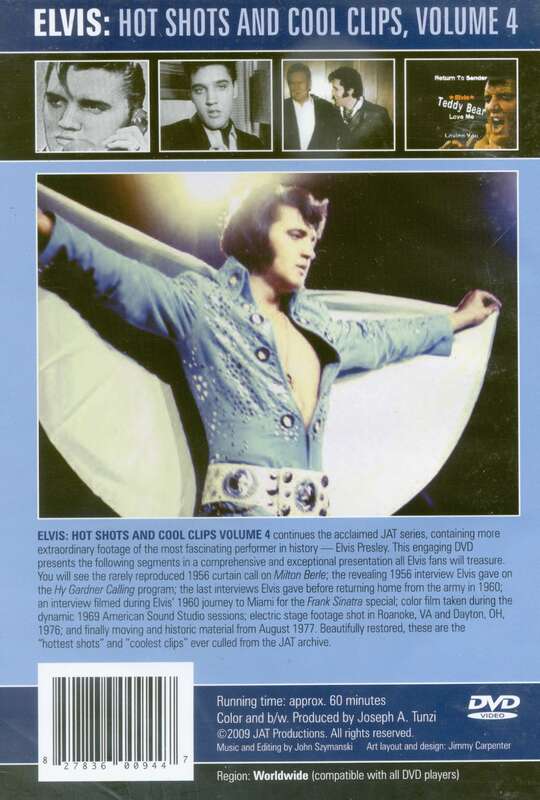 This engaging DVD presents the following segments in a comprehensive and exceptional presentation all Elvis fans will treasure. You will see the rarely reproduced 1956 curtain call on Milton Berle; the revealing 1956 interview Elvis gave on the Hy Gardner Calling program; the last interviews Elvis gave before returning home from the army in 1960; an interview filmed during Elvis' 1960 journey to Miami for the Frank Sinatra special; color film taken during the dynamic 1969 American Sound Studio sessions; electric stage footage shot in Roanoke, VA and Dayton, OH, 1976; and finally moving and historic material from August 1977. Beautifully restored, these are the 'hottest shots' and 'coolest clips' ever culled from the JAT archive. Customer evaluation for "Hot Shots And Cool Clips Vol.4 (DVD)"